We present the first general MPC protocol that satisfies the following: (1) the construction is black-box, (2) the protocol is universally composable in the plain model, and (3) the number of rounds is constant. The security of our protocol is proven in angel-based UC security under the assumption of the existence of one-way functions that are secure against sub-exponential-time adversaries and constant-round semi-honest oblivious transfer protocols that are secure against quasi-polynomial-time adversaries. 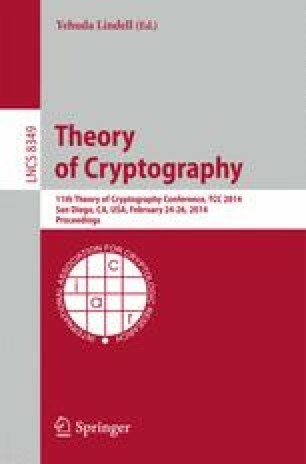 We obtain the MPC protocol by constructing a constant-round CCA-secure commitment scheme in a black-box way under the assumption of the existence of one-way functions that are secure against sub-exponential-time adversaries. To justify the use of such a sub-exponential hardness assumption in obtaining our constant-round CCA-secure commitment scheme, we show that if black-box reductions are used, there does not exist any constant-round CCA-secure commitment scheme under any falsifiable polynomial-time hardness assumptions.